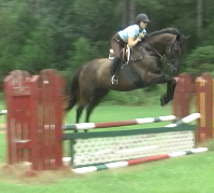 Years of experience at Belle Meade Hunt. Can whip-in or go mid field or carry the huntsman or lead the field. Good jumper. Good solid citizen. Easy keeper. Easy in the pasture with other horses. Not a bully or a chicken. Tough and solid. Happy carrying a man, woman or teenager. Good trail horse. A big beautiful Fox Hunter 17.1 dapple gray Percheron/TB cross. Big enough to carry any large person in the field and quiet enough to carry most levels of riders. 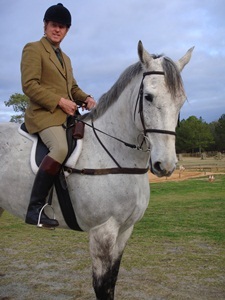 Has hunted with the Tryon Hunt in NC and the Belle Meade Hunt in Thomson, GA. 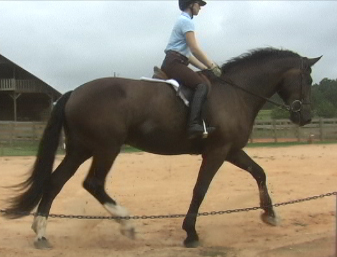 Fancy markings, nice mover, made hunter. Will lead or go in field. 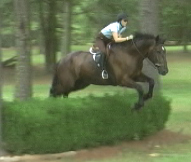 Hunted by Huntsman, Staff and in all fields at Belle Meade Hunt. Good jumper. Point and shoot at fences. Suitable for Master or FieldMaster. Good size for a man, but not too strong for a lady. Good in ring. Easy to trail ride. Independent. Willing manner and kind disposition. Nice ground manners and gets along in the pasture. Big, black & beautiful. Great head and neck, this outstanding horse has hunted with the Belle Meade Hunt as the Masters horse.This great horse is ready to start his show career, auto swaps, and will always get an undersaddle ribbon. A great first year prospect or an A/O, Jr Hunter.